Schriever Air Force Base is home to the 50th Space Wing, the Space Innovation and Development Center, the Missile Defense Agency, 310th Space Wing and numerous tenant organizations. 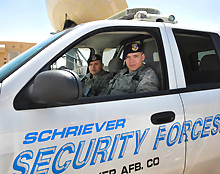 More than 8,100 personnel work on Schriever AFB, located approximately 10 miles east of Colorado Springs. They are very proud of their mission as they deliver the best possible satellite navigation, communications and surveillance to their users worldwide.